My old card reader suddenly stopped working while I was transferring some photos from my camera to the desktop computer. Thus, I was forced to buy a new card reader. I went to the nearest CDR King branch to buy the card reader. I remember that I complained about the CDR King USB extension cord that I bought the last time. CDR King is notorious for having products that malfunction for no apparent reason. CDR King is also notorious for very long queues and ultra-slow service but those are for another blog post. I told the sales clerk that I need a CDR King USB product that can be used to connect the SD Card of my camera to the laptop. She told me that the CDR King USB product that I need is a card reader. Then she showed me a wide selection of CDR King’s card readers. Of course I chose CDR King’s Curved Card Reader. 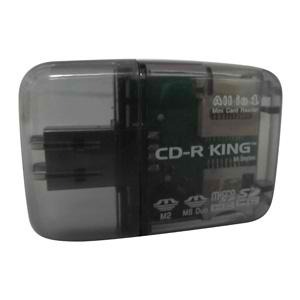 I almost didn’t believe that this CDR King USB product only cost 50 pesos. I even told the sales clerk that this CDR King product will not last because it is very cheap. My Curve Card Reader is already 5 months old but it still works fine. It is quite different from another CDR King USB card reader that my brother bought. It malfunctioned in less than a month. Well, I think that buying CDR King USB products is a sort of lottery. If you are lucky then you get a good product. If not then you’ll get the malfunctioning one. Image came from CDR King website.